It’s been a while since I’ve posted a recipe, and figured it was about time to post one that I think my readers would like. As the weather gets warmer, the nights longer and the clothing lighter, I tend to go for more seafood and shellfish and even just vegetarian options for my meals. I like to take advantage of all the fresh produce now available at all the local farmer’s markets in my area, and what better way to utilize them than in a tasty salad? Unfortunately where I live in the country, we are not able to get avocados at the farmer’s market, but I added some anyway for your healthy fat. This recipe is adapted from one of my favorite cookbooks (I have many) called “Spices of Life – Simple and Delicious Recipes for Great Health” by Nina Simonds. She has a great way of utilizing herbs and spices and a variety of foods from around the world to create very exciting and delicious recipes. Shrimp may be small in size but they pack a punch nutrition wise, plus they are really quick and easy to prepare. 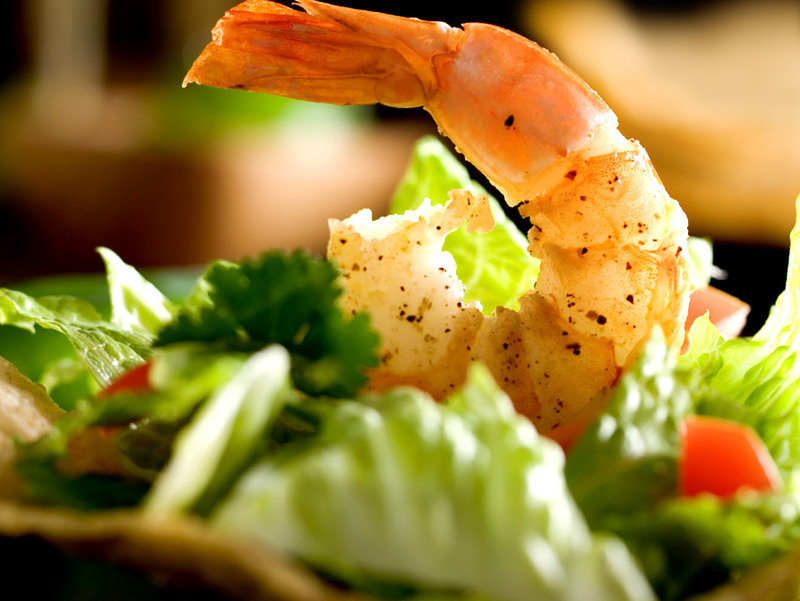 Four ounces of cooked shrimp contains about 112 calories, zero carbs and 24grams of protein! They are also a good source of omega 3 fatty acids, rich in minerals including copper, celenium and zinc, and are very low in fat (1gram per 4 oz). Select shrimp that have firm bodies and still have their shell on – they should be free of black spots and the shell should not appear yellow or gritty as that could indicate some sort of chemical has been used to bleach the shells (Yes, it does occur). Purchase displayed shrimp always rather than pre-packaged shrimp, and make sure they have a fresh smell (should not smell fish but more like seawater). For the greens in the salad, I like to use a mix of romaine, butter lettuce, arugula and some bitter greens like escarole, to get the different flavors (spicy, sweet, leafy etc) and textures. Ask your local farmer if they have any special or new kinds of greens – always experiment with ingredients and preparation methods, that is what makes wholesome cooking fun! First arrange the tomato slices on a baking sheet. Brush with 1 tbsp the olive oil (you can also spray them a bit with Pam if they seem not coated), broil the tomatoes for about 10 minutes on each side and remove. Drop the garlic down the feed tube of a food processor fitted with a steel blade with the machine is running. Pulse until finely chopped, then drop in the tomatoes and puree, leaving some chunks. While the motor is running, add the lime juice or vinegar and 2 tbsp of the olive oil in a thin, steady stream. Add the cumin, salt, pepper and chopped cilantro, pulse briefly then taste for seasoning, adjust if necessary. 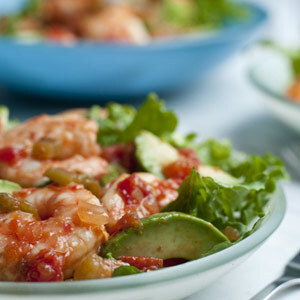 Arrange the shrimp, then the avocado slices, on top of the greens. Pour some of the dressing over and put rest into a sauce bowl. Sprinkle the minced red onion on top, if using. And chow down! !